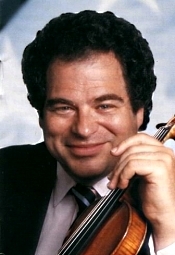 Itzhak Perlman, London Philharmonic Orchestra. Hi-Q HIQXRCD25. Another Four Seasons? Well, yes, but not exactly. It’s an old favorite EMI recording by violinist and conductor Itzhak Perlman and the London Philharmonic done up in fancy new audiophile trappings from the combo of Hi-Q, Resonance Recordings, and JVC. If you’ve always liked the Perlman performance, it now sounds better than ever. Although it comes at a price. 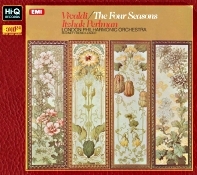 Since recordings of Antonio Vivaldi’s The Four Seasons appear so regularly, there’s little point in my describing them. There must be a hundred discs currently available, most of them sounding pretty good, so the choice is wide open. You probably have your own favorite recording of the piece, anyway, but in the event you don’t, here is some gratuitous advice from one who has seen most of the last hundred recordings of the work go through his living room. First, be aware that the standard recordings of the four violin concertos comprising the Four Seasons fall into three broad categories, depending upon ensemble: chamber groups using period instruments, chamber groups using modern instruments, and full orchestras (or pared-down orchestras) using modern instruments. For period groups (which I tend to favor) I love The Philharmonia Baroque Orchestra (PBO Records) and La Petite Bande (Sony) for their lively, small-scale interpretations and transparent sound; and the Drottningholm Baroque Ensemble (BIS) for their unique style, creative playing, and equally outstanding sound. Other good period-instruments recordings include the English Concert (DG Archiv), straightforward, fresh, and closely miked, but well recorded; and Tafelmusik (Sony), one of the best all-around renditions you’ll find. Among chamber ensembles using modern instruments, I like Marriner and the Academy of Saint Martin in the Fields (Decca) for their almost surrealistic approach to the score; I Musici’s second recording with Roberto Michelucci (Philips) for their subtlety and grace; and Solisti Italiani (Denon) and Janine Jansen and her Ensemble (Decca) for their no-nonsense presentations. Which brings us in a rather long-winded fashion to the big-scale accounts using modern instruments and the disc under consideration, Itzhak Perlman’s analogue LPO rendering from the mid Seventies. It is in a class of its own, and for years I have enjoyed it more than any other full-orchestral account. Now, understand, when I say full orchestra, I don’t mean to suggest that the entire London Philharmonic was in on the project. The booklet insert does not say how many members of the orchestra participated, but I suspect they reduced the numbers quite a lot, making the sound a touch leaner than it might have been otherwise. On the other hand, the accompaniment appears a tad fuller than on any of the chamber recordings, so I’m counting this as a full-orchestral account. Perlman is the solo violinist and the conductor in the performance, and the whole affair is as satisfying today as when I first heard it over thirty-five years ago. I’ve owned it on LP and on several previous CDs, and it continues to impress me. The interpretation may not be as vigorous as some of its smaller-ensemble rivals, but there’s an elegance and serenity about it that’s hard to resist. It is a smooth, relaxed, unforced, effortless reading that goes a long way toward negating any criticism of the work. Perlman shows us he has always been a world-class violist with his smooth, supremely confident reading. Although this may not be the most-demanding material ever written for the violin, Perlman handles it with eloquence, grace, and refinement, all the while maintaining a lively, yet never hurried pace. His mastery of the violin is remarkable to hear, especially as it all seems to flow so easily and naturally. Perlman never indulges in extroverted mannerisms or flashy finger work for its own sake; he simply plays the music in a thoughtful, caring, and wholly engaging style that is captivating. Interestingly, it's his execution of the slow middle movements that are the most-charming parts of the playing and second to none on record. What’s more, EMI’s analogue audio (recorded in 1976, digitally remastered in 1987, reissued by EMI in 2010, and remastered by HI-Q and JVC in 2013) is vintage EMI, among the best you will find in this piece. Producer Suvi Raj Grubbe and engineer Stuart Eltham recorded the music in May 1976 in Abbey Studio’s celebrated Studio No. 1. Admittedly, there isn’t a lot of deep bass or extreme sonic impact, but there doesn’t need to be; nor is there an abundance of depth to the sound stage, but, again, there doesn’t need to be. The violin appears well integrated into the acoustic field, in front of the orchestra but not sitting in our laps, and the violin tone is pure and natural. It’s clean, clear, warm sound that does nothing but contribute to one’s enjoyment of the music. In the JVC/Hi-Q remastering and transfer, the sound is marginally tighter and more transparent than in the regular-issue EMI, with a more-realistic luster to the strings and a bit more-prominent decay time. The sound had better be improved, of course, given the higher price involved, yet there is no doubting the Hi-Q's greater transparency; if you have the right playback equipment, the differences will be worthwhile. Certainly, a performance as fluid and praiseworthy as this one deserves the best-possible sound. However, this new release does bring up one obvious comparison: LIM’s remastered Four Seasons from Joseph Silverstein, Seiji Ozawa, and the Boston Symphony Orchestra, originally recorded by Telarc in 1981. Both the Hi-Q and LIM discs will give your pocketbook a workout, and both of them sound better than their equivalent standard-issue products. The Hi-Q has the marginally smoother, more lively performance; the LIM has the slightly more dimensional sound. I suppose owning them both is the best choice, but it’s a costly one. If I had to choose just one? I dunno. It’s not a choice I have to make. It’s a weaselly answer, I know, but if you already have a favorite between the two performances, I’d go with the interpretation I liked best. Be aware, too, that you can get the same Perlman performance on the low-cost EMI release I alluded to earlier, along with three companion pieces--the Violin Concertos RV 199, 347, and 356--made digitally a few years later (1982-83) with the Israel Philharmonic. It makes a fine, bargain issue, but it isn’t up to the audiophile standards of the current Hi-Q. Nor does it compare to the Hi-Q’s snazzy new packaging, which includes a glossy, hardcover Digipak-type case with bound notes, the disc fastening to the inside back cover.